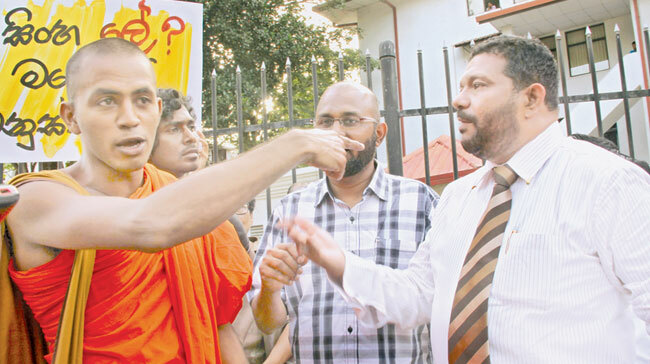 A tense situation erupted during the campaign of ‘Different yet Equal’ close to Baudhaloka Mawatha yesterday. A group of monks representing the “Singha Le Jathika Balamuluwa” disrupted the unity campaign claiming that the campaigners cannot use the term “Singha Le” during their demonstration. The ‘Different yet Equal’ refuted it saying that “Singha Le, Ekama Le”. “The motive of the ‘Singha Le’ organisation was to create a tense situation and to spread their racist ideology, Azad Sally said. “We organised a silent and peaceful demonstration to show that all people should be treated equally,” he said. However, monks representing the “Singha Le Jathika Balamuluwa” said the demonstration was organised to encourage racism. “It is a threat to national security,” they alleged. Differences are natural and divisions are socially constructed, said one of ‘Different yet Equal’ participants Subha Wijesiriwardene adding that they do not represent any organisation. They are a collective of citizens from different backgrounds gathered for a common cause. “We have voluntarily gathered here as group of friends and as citizens of Sri Lanka to stand for our right and to remind the public about our responsibility as citizens to create a peaceful society in which our different ethnic, cultural, and religious identities are valued equally,” she said. Sally said the government should take immediate action against the perpetrators. “We urge citizens to stand up against racism. We all have a collective responsibility. We are against racism and all kinds of discrimination. The demonstrators of ‘Different yet Equal’ also claimed that the Police failed to do their duty. They were biased towards “Singha Le” protestors. “Counter protesters were holding a distorted flag. Police made no move to arrest them,” the demonstrators said. Protest and anti protests tend to be counterproductive or a shallow exercise only for the media attention ..A little way to go where ever you live work or socialize might carry the message better to ease the racial divisive attitudes and also the class divisive attitude ..Give everyone a fair go is that possible in this competitive world , for we fear that we may loose our place if we do so . Azath Sally says he's against racism and everyone is equal because his Moslems are a Minority. Wait til they overtake the majority, then it will be Sharia Law at knife point. i have no problem whatsoever with the Hindus & the Christians , and that we can co-exist with peace, but the marauding and invading whabi muslims are a real threat to any society. Look around the world? where ever these tribal men lives, there's a problems, big ones.. so be hell with reconcile with the marakkalas invaders. Not all muslims share the thoughts of western funded extremists (yes isis fighters are paid and armed by the west) just like not all the Buddhists share your thoughts or the thoughts of the BBS. Plus Muslims aren't invaders, in that sense the now Sinhala population are too as..the original Sinha Le blood comes from India ..most families in Sri Lanka thanks to the trade routes have Indian, Arab, Portuguese, Malay and even African ancestors, it's time you did some research and realized that all the Buddhists, Tamils, Muslims and Burghers are an Achcharu..and there isn't a pure Le insight. The statement "I have no problem whatsoever with the Hindus & the Christians" and the rest of the comment that reflects an extreme view are at odds with each other.